Born: August 27, 1891 in Mansfield Ma. 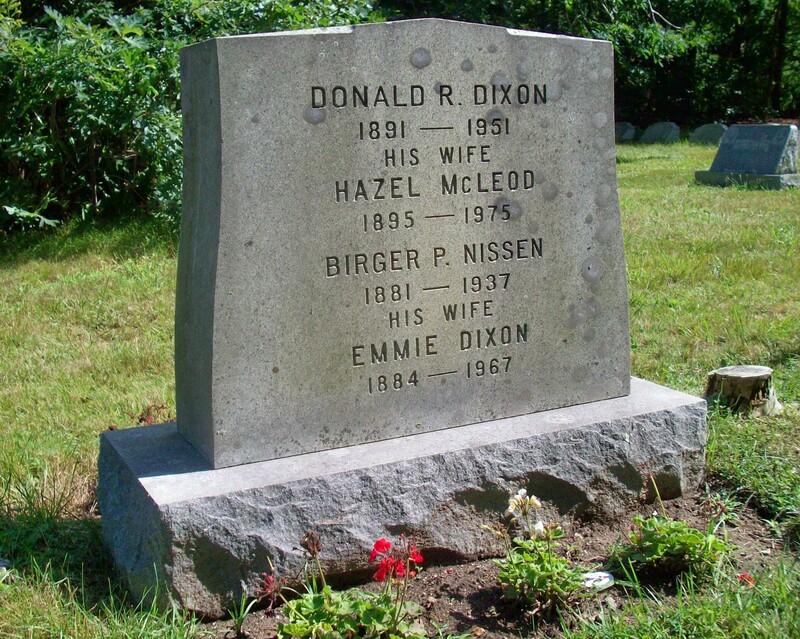 Died: June 15, 1951 in Bourne Ma. at 59 yrs, 9 mos, 19 d.
Married: May 7, 1923 in Hanover N.H.
To: Hazel Adaline Goodhue; (1895 – 1975) (George Albert Goodhue & Lucy Ann Clement); Hazel married (2) Peter McLeod (1891 – 1964) (Colin McLeod & Euphemia (–)) in Bourne Ma. on June 20, 1953; Peter married (1) Lucinda Hudson Pierce (1888 – 1952) (Thomas G. Pierce & Transylvania L. Gifford) in Middleboro Ma. on September 9, 1911. 1. Dorothy Ann Dixon Young Fuller; (May 27, 1926 – February 28, 2005); Married (1) Thomas Arthur Young (1922 – 2009) (Jacob A. Young & Ruby Masso) in Bourne Ma. on October 6, 1945 & married (2) (–) Fuller; Thomas married (2) Alice Cecelia (Saunders) Collier (1921 – 2002) (Percy Roy Saunders & Margaret Elizabeth Wood) in Richmond Va. on December 29, 1956; Alice married (1) John William Collier (1919 – 1996) (Jesse W. Collier & Annie Robinson) in Brunswick Va. on April 25, 1939; Alice & John divorced in 1954; Dorothy died in Bellingham Wa. 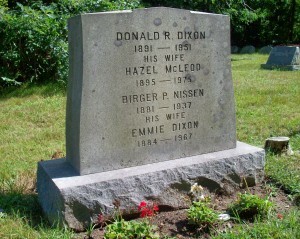 & is buried near her parents in Pocasset Cemetery. 2. John Benjamin Dixon; (April 7, 1928 – ? ); Married Barbara Joan Jennings (1940 – ?) (Walter R. Jennings & Margaret L. Fontaine) in Bourne Ma. on August 28, 1954. 3. Florence Marie Dixon Prince; (October 3, 1930 – ? ); Married Richard Maurice Prince (1928 – 2000) (Thomas W. Prince & Louise A. Atwood) in Bourne Ma. on August 30, 1952.